It's true enough when its said that The Lady of Mercia won't win any awards but I think it should, good solid fun could be a category to possibly nominate it in. Following on from a run of mediocre releases in 2013, The Lady of Mercia picks up the ball that had been dropped early in that year. The problem with the first story of this trilogy, Eldrad Must Die! was that the characters felt slight but there is no problems here. The most troubled TARDIS crew is on top form here, with Turlough as shifty and cowardly as ever, Nyssa being helpful, Tegan being thrown into events till its over her head and the Doctor left feeling beleaguered. While there is no particular insights into their characters it is amusing to hear how Mark Strickson says "Barry" as Turlough! For a story that mixes the past with 1983, the plot is incredibly simple. Tegan is sucked back into time after an accident with a home made time machine and Queen AEthelfrid's daughter, caught up in the resulting confusion is brought to 1983 and the result is that the Doctor has to run around fixing the problem. But it is incredibly good fun with author Paul Magrs laying things on characters to get more depth from them and the story and really engaging the audience with the story, the concepts and the number of characters involved. What also becomes apparent is that Magrs is the master of escalation with things getting worse and worse as the story progresses. The guest cast are strong but two actors have to be given extra credit. Rachel Atkins who plays Queen AEthelfrid turns what could be a boring character into one who is engaging to listen too and Anthony Howell who plays Professor Bleak gives us one of the most cowardly characters in the show's history is no less enjoyable because of it. The regulars are great fun to listen to and the script gives Janet Fielding a lot more to do as Tegan Jovanka, my favourite companion. She rises to the challenge and after listening to this story and the others she has done since she joined Big Finish, one wonders why the television series never gave her things like this to do. She is clearly capable. When I listen to stories with this team I listen for their bickering and banter and this story delivers it all well. While the history might be a bit vague it is far more interesting than anything we were taught at school and the whole thing keeps the listener switched on and invested in the story for its duration. 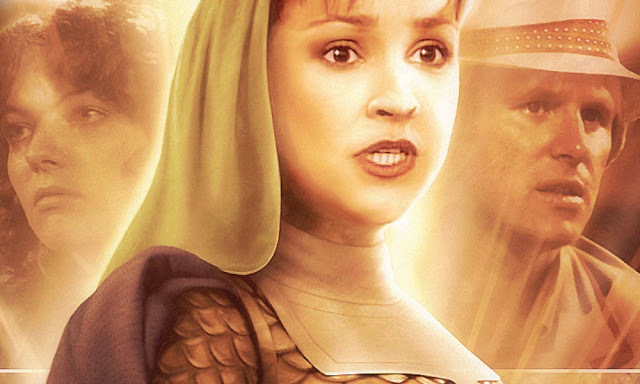 THE LADY OF MERCIA, WRITTEN BY PAUL MAGRS AND STARRING PETER DAVISON, JANET FIELDING, MARK STRICKSON AND SARAH SUTTON WAS RELEASED BY BIG FINISH PRODUCTIONS IN MAY 2013.